January 26th is the 3rd Sunday in Ordinary Time. “The Latin Root of the word education means to draw out or to lead. It is appropriate, therefore, that in the same Gospel passage in which we hear Jesus invite the apostles to follow him, we also hear of how he taught the people. In Matthew’s Gospel, Christ begins his ministry by involving the words of the prophet Isaiah, who makes use of the image of light. Light is a curious phenomenon for those of us living in the modern age. The invention of artificial lighting systems risks separating us from the natural light that is part of the beauty of creation. Some would argue that an increased reliance on light may even be a cause of growing incidences of depression in our society – a condition often associated with darkness. This gift of teaching is similar to the gift of light. Like the light that gently guides us along the path, a good teacher skillfully guides us to understanding. Christ calls each of us to our particular ministry through the actions of these capable and compassionate sisters and brothers. Let us give thanks for all who have taught us the faith of our ancestors. May we be strengthened in our efforts to continue to teach what has been passed down to us, with praise and thanksgiving, acknowledging the light that leads our way.” John O’Brien, January Living with Christ, page 127. January 28th is the memorial of St. Thomas Aquinas. “Thomas was born to a noble family around 1225, in Aquino, Italy. When he was five or six years old, his mother and father sent him to the Benedictine Monastery at Monte Cassino to study. In the fall of 1239 he transferred to the University of Naples to continue his education. In Naples, Thomas met some members of a new religious order called the Order of Preachers. Their founder, St. Dominic, was still living. Thomas knew that he wanted to be a priest, and he felt called to the life being lived by the followers of St. Dominic (soon to become known as the “Dominicans”). Thomas joined the Order of Preachers, but his family was totally against his decision. His brothers even kidnapped him and brought him back to Roccasecca castle. His family kept him there, almost like a prisoner, for about fifteen months, trying to make him change his mind. But Thomas spoke so beautifully about the joy of serving God that they finally changed their minds and let him go back to the Dominicans! Thomas rejoined the Order in 1245, and was sent to study at Paris. Even though he was very intelligent, Thomas was always very humble. He never showed off. In fact, his classmates often thought that he was not very bright because he was so quiet in class. Thomas was ordained a priest at Cologne, Germany, in 1250…After his ordination, Thomas began to teach at the University of Paris. He soon became famous for his wonderful teachings about the Bible. …St. Thomas wrote so well that people all over the world still use his books. His explanations about God and the faith came from his great love for God. Thomas was effective because he wasn’t trying to make an impression on anyone. He only wanted with all his heart to offer the gift of his life to Jesus and the Church. Even though his intelligence was amazing, Thomas knew that holiness of life was the most important thing.” Saints for Young Readers for Every Day, vol. 1 pages 51-53 St. Thomas, encourage us when we meet a difficult lesson or idea that we have to learn. Inspire us to believe that we are called to holiness and that it is the most important thing. Every time you wash your hands today remember that holiness is the most important thing. January 31st is the memorial of St. John Bosco. “John Bosco was born on August 16, 1815, in Becchi, a small town near Turin, Italy. His parents were poor farmers. When John was only two years old, his father died. John’s mother struggled to keep the family together. As soon as he was old enough, John began working as hard as he could to help his mother. As he grew up, John started to think about becoming a priest. But he didn’t say anything to his mother because he knew they couldn’t afford the seminary tuition. Besides, his mother needed help to run their farm. So John waited and prayed and hoped. Finally, a holy priest name Don Joseph Cafasso (“Don” is a special title of respect and honour which people in Italy use for priests) became aware of John’s desire. Don Cafasso helped him enter the seminary. John had to work his way through school. He learned all kinds of trades. He was a carpenter, a shoemaker, a cook, a pastry maker and a farmer. He did many other jobs as well. He could never have guessed how much this practical experience would help others later on. John became a priest in 1841. After his ordination, Don Bosco began working with Don Cafasso visiting the prisons in Turin. He was saddened to see how many boys were in the prisons, and how hopeless their futures were. Don Bosco decided to open a home for troubled boys. Because of his kindness and caring, it was easy for him to attract youngsters. Don Bosco taught the boys different trades so that they could get good jobs and not be tempted to steal or get into trouble. He prayed with them, and took them on outings. He even organized a brass band! By 1850, there were 150 boys living at his home for boys. Don Bosco’s mother was the housekeeper. At first, people didn’t understand what Don Bosco was trying to do. But soon everyone began to realize that he was carrying on a very important work. His boys were learning skills and receiving an education. They were becoming young men who would contribute to society instead of turning to lives of crime. Don Bosco even built a church for the boys. Daily mass and the sacrament of Reconciliation were the foundation of their whole education. Don Bosco felt that his success with the boys was due to an attitude of love and respect rather than the use of harsh discipline. Religious instruction and prayer helped the boys want to lead good lives.” Saints for Young Readers for Every Day, vol. 1 pages 57-58 Don Bosco, you were not afraid to use your hands to accomplish your goals, teach us to do the same. Compliment the work done by someone who works with their hands today! January 31st is the birthday of Thomas Merton (1915-1968). • Proclaim with confidence a belief in the mysteries of the Catholic faith, the Creed. Below is the expectation with a suggested explanation of how the scripture passage can be interpreted for the students. Grade Four: BL1.1 Identify the various forms of literature found in the Bible (e.g. narratives, wisdom sayings, psalms-prayers, moral teachings, parables, the life and ministry of Jesus – Gospels) and explain how the literary form influences how we read and interpret scripture. Narrative – Genesis 1 – 2:3 The six days of Creation and the Sabbath is a narrative written to describe how the creation of everything was accomplished by God. Wisdom sayings – The book of Proverbs has many examples of wisdom sayings. Authorship is given to King Solomon, however, the actual author is unknown. Psalms – prayers – The book of Psalms are prayers thought to be composed as songs for worship. There are 150 psalms in the Scriptures. They are based on many themes. Moral teachings – Deutero. 5:1-21 (The Ten Commandments) and Luke 6:27-36 Love for Enemies. These are moral teachings given to us so that we can live good and holy lives. There are many moral teachings in the Bible. Parables – there are many parables, one example is The Parable of the Sower – Luke 8:4-8 [Mt. 13:1-9; Mk 4:1-9 are the synoptic parallels of the same parable.] Parables are intended to teach a lesson through imagery. The life and ministry of Jesus – Gospels (Matthew, Mark, Luke and John) are written accounts of how Jesus lived and did ministry with the people around him. Gospel comes from the word Old English word meaning Good News. Each of these literary forms influences how we read and understand the scripture. “In order to discover the sacred authors’ intention, the reader must take into account the conditions of their time and culture, the literary genres in use at that time, and the modes of feeling, speaking and narrating then current. For the fact is that truth is differently presented and expressed in the various types of historical writing, in prophetical and poetical texts, and in other forms of literary expression.” CCC 110 So for example we do not read the Genesis reading like we would an article in the newspaper. People were not created until Day 6 so we cannot read the passage literally. We read the passage and understand that God created the world. It took time for all of creation to become what it is. And God thought it was good. God gave stewardship of creation to humankind. So we read the passage with a contextual understanding. 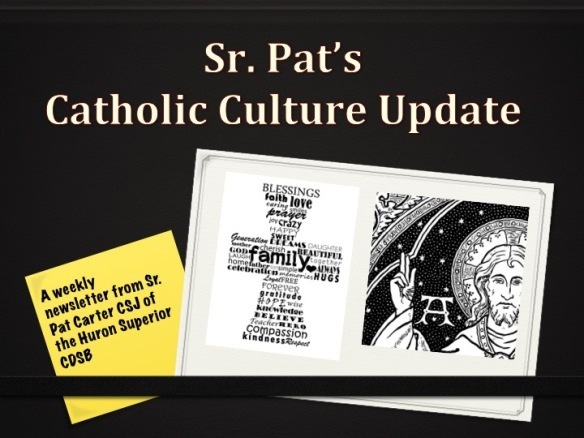 Grade Five BL1.2 Define the distinction between Tradition and Sacred Scripture and explain how the Church Magisterium hands on Divine Revelation received through Sacred Scripture and Tradition. Sacred Scripture is the Word of God as inspired by God and written by human beings. There are two parts to the Bible, the older texts called the Jewish Scriptures (we share these texts with the Jewish community) and the newer texts called the Christian Scriptures. The Bible is actually a library of 72 separate but related books. Tradition is everything else that helps define our Catholic identity. It is the way that the faith is transmitted through the Holy Spirit and distinct from Sacred Scripture. Through Tradition, the Church teaches us what to believe (creed/dogma), how to live (virtues/prayer/morals) and how to worship (sacraments/rituals/community building). [CCC 85-90] To protect the interpretation of Scripture and Tradition the Church has the Magisterium, the teachers of the Church. Church Magisterium consists of all the bishops and the Pope, the bishop of Rome. The Magisterium is entrusted with the task of interpretation; the Magisterium is the living teaching office of the Church. The Magisterium is responsible to help the people of God to be faithful to the Divine Revelation as it is experienced in Tradition and Scripture (the sacred deposit of the faith) in a particular time and culture. Grade Six BL 1.2 Compare Church teaching on the relationship between faith and reason with the approach of natural and human sciences and explain how the latter might lead to an erroneous belief in God’s non-existence. (Reason and faith work together to assure us of the existence of God, i.e. Truth) The Church teaches us that our desire for God is written on our hearts, because we were created by God and for God; and God never stops drawing us to himself. Only in God will we find truth and deep happiness. (faith) Sometimes humans forget, overlook or even reject their relationship with God. God never forgets, overlooks or rejects us, even if we do it to God. There are many ways to come to know and love God. These can be called proofs for the existence of God; we come to these proofs by observing the world and being open to its order and beauty. As well, our human sense of moral goodness, our freedom and the voice of our conscience, helps us to come to understand that we can have our origin only in God. (reason) The Church teaches that the one true God, can be known with certainty from God’s works, by the natural light of human reason. [CCC 47] Natural and human sciences seek to find the truth is their study of absolutes (proofs). The scientific method experiments to prove hypotheses and creates truth through replication of results. So without methods to prove the existence of God these sciences might lead a person to the error of God’s non-existence. We require both faith and reason working together not just reason as the sciences would instruct us. If we try to prove the existence of God without faith, we will fall short. ‘The person who sings, prays twice’ – a popular quote attributed to St. Augustine – reminds us how music, hymns, and songs are ways to pray. Sacred music, hymns and songs have a long tradition of conveying theme and images for prayer. In addition to compositions that are set to music, poems have expressed images and thoughts that can be used to mediate and pray. The works of such renowned poets as Gerard Manley Hopkins, T.S. Eliot, G.K. Chesterton, Joyce Kilmer, John Henry Newman, and others, illustrate how this artistic writing form has been utilized to convey religious thoughts and spiritual insights. Poetry offers a way to be a teaching device in which the repetition of a phrase, thought, or key word remains with the listener after the poem has been read.” Paulist Press page 138. “Implementation Matters. IDENTIFY INDICATORS OF PROGRESS. In schools, our goals for improvement often are vague, in which case it is hard to know if we are making progress. School should try to set measurable progress indicators or targets on important equity goals. …It is vital to collect data to see if progress towards the goal is being made and to share that information broadly so that everyone can assess the progress. …No measure is perfect; every measure has its limits and a certain amount of error.” Breaking Barriers: Excellence and Equity for All page 143. 1.12 min. Amazing talent. You will never look at your washing machine the same way after you see this video. http://www.godtube.com/watch/?v=WY6PZPNX&utm_source > This dog thinks it is a fire truck – 29 sec. Kids would love to see this dog. Could be used to launch into a writing assignment? Do you want to find meaning in your work and joy in your vocation? Do you seek the freedom to use your God-given abilities to their full potential? The Institute for Faith, Work & Economics is committed to walking along side you in both of these endeavors. Visit us at tifwe.org or on our Facebook page, and let’s work together for the freedom to flourish! “Could a Plant Weigh More Than a Puppy Dog? BONUS question: Why did Jesus get baptized with the baptism of repentance when he was without sin? What does your faith and reason tell you? 1. On what matters can the Pope speak infallibly? 2. What is the Curia? 3. When was the last Ecumenical Council of the Church? 4. Who is our local representative in the Magisterium? 5. What is the English name of the Declaration of Lumen Gentium? the greatest sites on the web. I will recommend this blog! I think the admin of this web page is really working hard in support of his web site, because here every stuff is quality based material.